It’s getting to be summer and that means camping time! 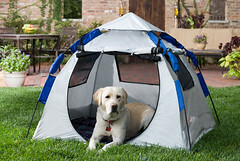 Now your dog can enjoy the great outdoors in his own tent. The ABO Gear Instant Dog Haus is an easy to assemble tent that is made of extra sturdy, claw proof fabric. Get your hiking shoes on, Fido because we’re going to be one with nature! This entry was posted on Tuesday, May 29th, 2007 at 3:50 am	and is filed under Dogs, National Dog, Cat & Pet Info, Products & Services for Cats & Dogs. You can follow any responses to this entry through the RSS 2.0 feed. Both comments and pings are currently closed. These tents are great! I’ve seen people using them at agility events. Well constructed and provide shade and good air circulation.